APRIL IPP Sofie Pridgeon, Wasleys Piggery, SunPork Farms, South Australia. 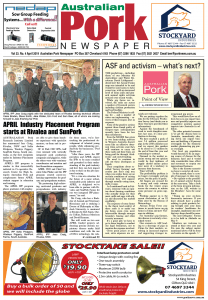 AUSTRALASIAN Pork Research Institute Limited has announced Jess Craig, Rivalea, NSW and Sofie Pridgeon, Wasleys Piggery, SunPork Farms, South Australia, as the first recipients under its Industry Placement Program. APRIL’s IPP program is similar to that successfully initiated in Co-operative Research Centre for High Integrity Australian Pork and complements future APRIL student support in education and training. The APRIL IPP program places graduates with employers able to give them hands-on experience with specialist mentors, on-farm and in production. Of 14 Pork CRC IPPs, half were interned with vertically integrated pork production companies and piggeries, while the others were with veterinary consultancies and nutrition and feed formulation companies. APRIL CEO and Chief Scientist John Pluske said the IPP program created career-enhancing opportunities for graduate and postgraduate students. APRIL IPP Jess Craig, Rivalea, NSW. “By partnering high-achieving, motivated graduates and postgraduates with industry for three years, we’re fast-tracking the professional development of talented young people, while enhancing productivity for businesses,” Prof Pluske said. “After three years, the IPP providers and APRIL expect the IPPs to be more rounded and grounded in their understanding of the pork industry and how they can best impact it due to their on-the-job mentored training. “It’s a win-win situation for the future of a more robust, sustainable pork industry and APRIL is delighted we’ve been able to partner with Rivalea and SunPork Farms for our two inaugural IPP placements,” he said. Ms Craig, who has a Bachelor of Animal and Veterinary Bioscience and is studying a Doctor of Philosophy at Murdoch University, is mentored at Rivalea by Rob Smits, Cherie Collins, Rebecca Morrison and David Henman. She will work on two new APRIL funded projects addressing porcine chronic respiratory disease under field conditions and, with the use of DXA technology, the relationship between energy intake and protein deposition in 60-100kg pigs. Additionally, Ms Craig will co-ordinate and facilitate experiments as principal investigator in a new APL-funded project at Rivalea examining gilt progeny. 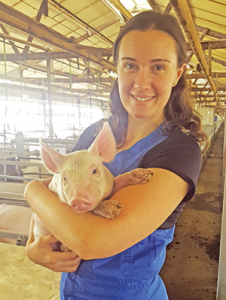 Ms Pridgeon, who has a Bachelor of Animal Science and has been employed at SunPork Farms’ Wasleys Piggery for the past two years, will be mentored by SunPork staff David Lines, David Maclean, Kate Plush and Sally Tritton. 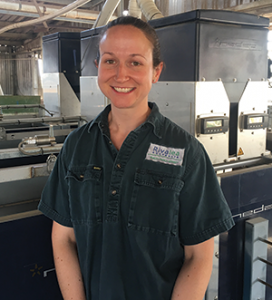 She will work on two APRIL-funded projects concerning the important industry issue of seasonal infertility, with Dr Kate Plush of SunPork Farms South and Dr Sean O’Leary, University of Adelaide. APRIL’s Education Advisory Committee, chaired by Prof Frank Dunshea of the University of Melbourne, considered and objectively assessed eight very high-quality IPP applications last September before announcing the two inaugural IPPs.